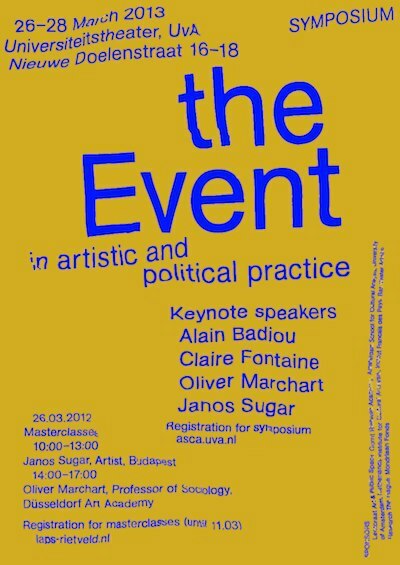 In contemporary artistic, media and philosophical discourses the notion of the 'event' has gained considerable currency. Since the 1990s the event has been central to a range of performative, media-based, socially and politically engaged artists' work, as well as in artists' involvement in/with non-artistic projects and practices ranging from political protest to scientific research. The growth of interest towards the potentials of art openly working with reception and/or participation as its methods has also lead to institutional commissions of this type of artistic work. For the institutions event-based art has triggered entirely new questions about the documentation and preservation of artistic practices. While the concept of the 'event' has been extensively elaborated upon in some fields – for instance, in theatre studies, urban studies and especially in philosophy, in recent art history and cultural theory, there are still few attempts of theorization. 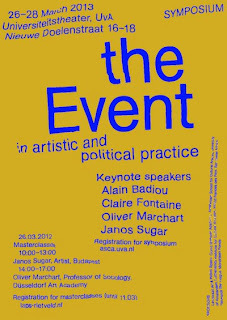 This conference sets out to articulate the meaning of the 'event' in relation to artistic, media-based and performative cultural practices. We invite presentations articulating the range of performative, conceptual, media-based, game-based, relational, participatory and other practices that can be approached as events. Elaborations on the methodological issues of studying events are also welcomed. Alain Badiou is René Descartes Chair at the European Graduate School EGS in Switzerland, formerly Chair of Philosophy at the École Normale Supérieure Paris. Oliver Marchart is Professor of Sociology at the Düsseldorf Art Academy. Claire Fontaine is a collective artist based in Paris. János Sugár is an artist and theorist of public art and media based in Budapest. Conference organisers: Margaret Tali, Thijs Witty, and Eva Fotiadi.